I decided to use a lot of my favorite Heather Ross & Munki Munki prints in this quilt, along with similarly colored basics. 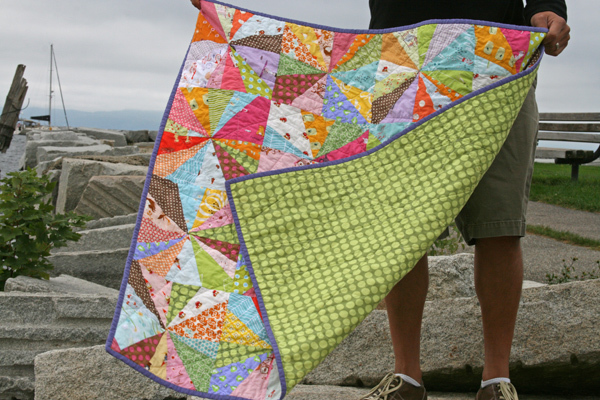 I love that it makes for a really bright and colorful quilt, with lots to look at! I used the Amy Butler Sunspots in green for the backing, and quilted it with lots of great straight lines. The lines meet in several spots to form a starburst pattern with the quilting. I couldn’t decide on the binding, but ultimately went with a purple solid to pull out the bits of purple used in the quilt top. This quilt measures about 36″ square, and I can really imagine it as a great playmat for a little one. It is listed in the shop now! 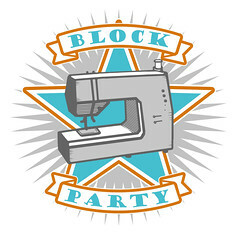 You can find the tutorial for this quilt block here. This entry was posted in [search] Liberated Quilts, [search] Wonky/Improv Quilts, 2010 Finished Quilts, Finished Quilts, Posts about Quilts, Quilts and tagged baby quilt, handmade, Heather Ross, munki munki, playmat, quilt, quilting, starburst. Bookmark the permalink. i think the weather was perfect for your pictures. 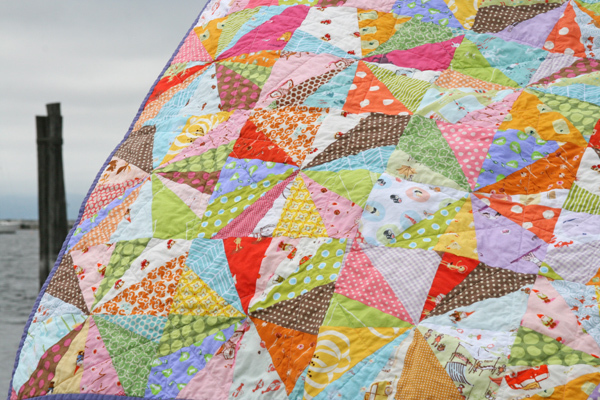 i love how the quilt pops out against the grayish background! I just love the colors in this one. Great job 🙂 And fall is certainly upon you there! this is a really fun quilt! I love all the cheerful colors used in these great blocks. I love the backing and binding fabrics you used to finish this. I’m a big fan of various line quilting, so I think the quilting works great for this design! I love this one Ashley! The Munki looks great with all those coordinating prints. BTW, did you see I finished my quilt inspired by your “postcards”? Thanks for the inspiration once again! I like that a lot! One of my favorites so far. Love the bright colours. 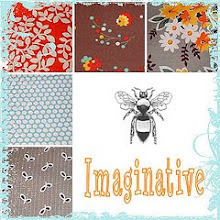 Looks great.Would make a lovely play mat for a little one or for the cot. Like the nice legs behind the quilt. Wonderful! 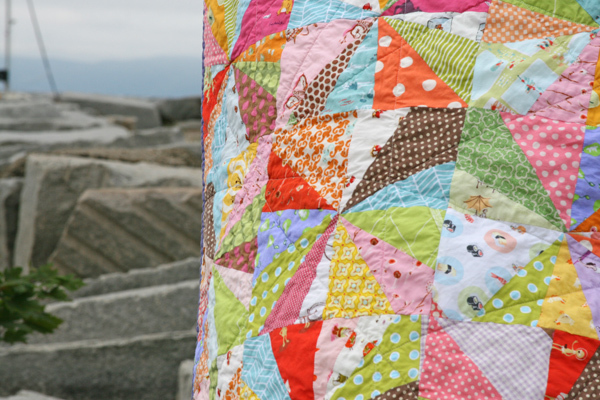 I just love bright, scrappy quilts. Some little one will be fascinated by all the colors and patterns. I want it! I want it! Baby #3 is coming in less than 8 weeks! It would be great to have at the hospital for her!!!! Love, Love, Love it! What a gorgeous quilt for a very lucky little one! thank you for being a constant source of inspiration for me! Ashley, this is such a happy little quilt…great work, lady! What a wonderful quilt! How do you prepare your quilts before quilting to avoid crumpling at the cross of the quilting lines? I tried to make such nice quilting grids like yours but there is such a lot of crumpling? 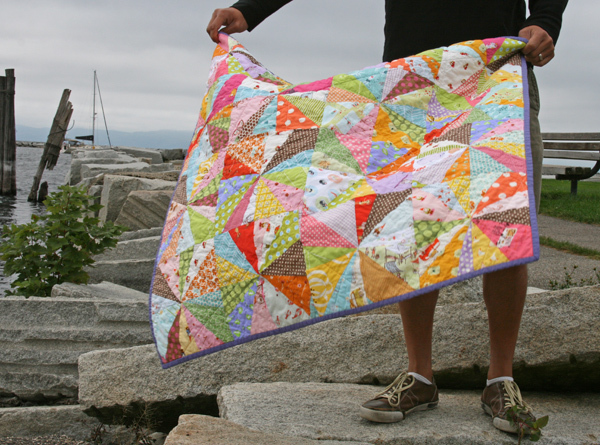 Lovely lil quilt- and what GORGEOUS weather… I can feel the soft wind just looking at the photo! OH I want this sooo bad for my daughter. I am a quilter and have made her so many but this one just speaks to me. Cant wait for you to list this. Just beautiful! Very inspiring… Thanks for sharing!